François Truffaut followed up the international phenomenon Jules and Jim with this tense tale of infidelity. The unassuming Jean Desailly is perfectly cast as a celebrated literary scholar, seemingly happily married, who embarks on an affair with a gorgeous stewardess, played by Françoise Dorléac, who is captivated by his charm and reputation. As their romance gets serious, the film grows anxious, leading to a wallop of a conclusion. Truffaut made 'The Soft Skin' at a time when he was immersing himself in the work of Alfred Hitchcock, and that master’s influence can be felt throughout this complex, insightful, underseen French New Wave treasure. When a director's filmography is filled with pioneering masterpieces like 'The 400 Blows' and 'Jules and Jim,' it can become easy for some other efforts to slip through the cracks. After all, Francois Truffaut has made so many notable and widely regarded French New Wave classics, that it's only natural for there to be a few overlooked titles throughout his body of work. Originally panned upon its initial release in 1964, 'The Soft Skin' is such a title. Heavily informed by the works of Alfred Hitchcock, the movie offers a suspenseful look at the rise and fall of an adulterous relationship, casting a tense shadow over love's blossoming embrace. Pierre Lachenay (Jean Desailly) is a successful writer and editor who lives a seemingly ordinary and happy life with his wife and daughter. But when he meets a beautiful stewardess, Nicole (Françoise Dorléac), the man becomes transfixed. After confirming their mutual attraction, the two embark on an illicit affair. With passions ignited, the lovers attempt to keep their relationship a secret, but potential exposure lurks around every corner threatening to ruin their burgeoning romance. In the included special features, director Francois Truffaut elaborates on his goal of creating "an autopsy of adultery," and really, that description couldn't be more appropriate. Using a carefully measured visual style greatly influenced by the works of Alfred Hitchcock, the movie offers a tense yet meticulous examination of infidelity, carrying us through the affair's humble beginnings, passionate zenith, and ultimately tragic end. Initially, the relationship begins only through a series of powerful glances, creating escalating desire through key looks, close-ups, and reaction shots between our two illicit lovers. These longing expressions slowly build toward greater action, and through Truffaut's lens, adultery becomes framed like an intricate crime, milking potent suspense from the ever looming threat of getting caught. Tension is constructed, extended, and decompressed through careful manipulations of time and rhythm, with the filmmakers employing a mixture of deliberate editing and long takes to tell the story. Intensifying montage is used to speed up the tempo and engender a sense of uncertainty, using specific series of cuts between people, objects, and locations to heighten the drama's level of risk. In contrast, sustained, reframing scenes tend to carefully draw out moments and emotions, like when Pierre first calls Nicole on his hotel phone, engendering a different tempo of anticipation. Other stylistic flourishes such as freeze frame, POV, dissolves, and voyeuristic telephoto zooms are used as well, though these flashier elements are applied sparingly, helping to create a comparatively clinical and dry aesthetic that is slightly at odds with some of Truffaut's other more visually exuberant efforts. That's not to say that the approach here is completely sterile, however, as there is a gently sensual and tragic undercurrent throughout the film's runtime, perfectly bolstered by Georges Delerue's somber score. Unfortunately, the plot does veer toward the melodramatic in the third act and the story itself is rather basic and predictable. Likewise, though the performances are strong, we never really get much of a sense for any of the characters beyond their adulterous actions, making it difficult to care about their conflicts. Pierre, Nicole, and Pierre's wife are never particularly likeable. Instead they are more neutral and increasingly unpleasant figures that never really display much personality or depth. Ultimately, Truffaut's cinematic approach to the story proves to be far more compelling than the story itself. While there is a lot to admire about the filmmaking on display, one can't help but wish that the plot and characters were a bit more fleshed out and original. 'The Soft Skin' is still a worthy title from the legendary director, but it just feels a tad ordinary and restrained when compared to his stronger masterpieces. Rooted in the potent visual tools of Alfred Hitchcock and filtered through Truffaut's own unique sensibilities, the film serves as an imperfect yet stylistically deep examination of infidelity, creating a kind of silver screen affair between "The Master of Suspense" and one of the French New Wave's central pioneers. 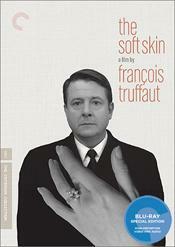 Criterion presents 'The Soft Skin' in their standard clear case with spine number 749. The BD-50 Region A disc comes packaged with a pamphlet featuring an essay by critic Molly Haskell. Sourced from the original 35mm camera negative, the movie is provided with a 1080p/AVC MPEG-4 transfer in the 1.66:1 aspect ratio. Beautifully restored, this is a strong picture free from any major technical issues. The print is in nearly pristine shape with only negligible specks, lines, and scratches during fleeting instances. A light layer of grain is visible throughout, and while mostly natural, the grain structure can appear a bit static and digital in certain shots. Clarity is nicely rendered, and though the movie is a little on the soft side, fine details and textures are readily apparent in faces, costumes, and locations. Depth is also solid and the grayscale is wonderfully balanced with bright whites and mostly inky blacks. With that said, contrast pulsing is present during a few sequences, and some nighttime scenes are comparatively elevated. A hint of edge enhancement is also evident, but does not detract much from the video. It might not be among the most impressive black and white transfers that I've come across, but 'The Soft Skin' arrives on Blu-ray with a very pleasing, clean, and respectful image. The audio is presented in a French LPCM mono track with optional English subtitles. Age limitations are apparent, but this is a perfectly serviceable mix. Dialogue is relatively clear, but the overall track has a comparatively thin and slightly strained quality. Though reserved, the mono design offers appropriately subtle ambiance. Georges Delerue's bittersweet score comes through nicely as well, but the music has a fairly flat sound. Thankfully, there are no major signs of crackle, hissing, or pops. The audio is limited by its age, but for a 1960s mono mix, the track gets the job done just fine. Criterion has put together a solid collection of supplements, including a commentary and a few worthwhile featurettes about Truffaut and Alfred Hitchcock's mutual admiration for one another. All of the special features are presented in 1080p or upscaled 1080i with Dolby Digital 1.0 audio and English subtitles for the foreign language portions. Audio Commentary with Jean-Louis Richard and Serge Toubiana – Recorded in 2000 in French with English subtitles, this commentary features a discussion between the film's screenwriter, Jean-Louis Richard, and Francois Truffaut scholar Serge Toubiana. Richard addresses his working relationship with Truffaut, writing process, the cast, and the film's Hitchcock influence and initial failure, rounding out an informative track. The Complexity of Influence (HD, 12 min) – This video essay by Kent Jones elaborates on Alfred Hitchcock's influence on Truffaut's film and the very nature of artistic influence in general. Jones offers insights on the stylistic similarities and differences between both directors, leading to a rather interesting discussion. Monsieur Truffaut Meets Mr. Hitchcock (HD, 30 min) – This documentary focuses on the creation of Truffaut's famous interview book with Alfred Hitchcock, tracing the events that brought the directors together. Family, friends, and colleagues offer details about Truffaut's passion for Hitchcock's films and we get to hear excerpts from letters written between both directors and audio recordings from the interviews Truffaut conducted. With great insights into two legendary filmmakers, this is a very worthwhile inclusion. Truffaut on The Soft Skin (HD, 11 min) – Here we get an excerpt from a French TV program that features an interview with Truffaut discussing the movie. The director details his inspiration for the story, analyzes his visual approach to certain scenes, and addresses the difficulties of using unlikeable protagonists. Francois Truffaut's 'The Soft Skin' is a mostly forgotten but still very worthwhile entry in the director's legendary filmography. Highly influenced by the works of Alfred Hitchcock, the movie features a tense and carefully crafted visual style, drawing out suspense and intrigue. The video transfer and audio mix are both very good, resulting in a respectful and pleasing technical presentation. Criterion has also included a few worthwhile supplements that focus on Truffaut and Hitchcock's friendship. Though the film isn't in the same league as some of the director's more notable titles, this release still garners a solid recommendation.